The Byrds were a popular folk rock band, from California. Their members included Jim McGuinn (who later changed his name to Roger), David Crosby, Gene Clark, Chris Hillman and Michael Clarke. Later band members included Gram Parsons, Clarence White, and Gene Parsons. The Byrds pioneered folk rock, a blend of folk music with rock and roll. Many of their songs were remakes of Bob Dylan's songs, such as "Mr. Tambourine Man", which was their first hit in 1965. They recorded a bright, uplifting version of "Turn, Turn, Turn", which had been adapted by Pete Seeger from Ecclesiastes in the Bible. Other songs were written by band members. The Byrds recorded "So You Wanna Be a Rock'N'Roll Star?" about the Monkees, not liking the star-making machinery that made the Monkees famous overnight. McGuinn later said the song was about the pop music business, not the Monkees. They softened their opinions, though, once they'd met the band and saw they had real talent. Members of the Byrds played on Monkees recording sessions, and the later band Crosby, Stills & Nash was formed partly from meetings at Peter Tork's house. One Byrds song, "You Showed Me", became a hit for The Turtles late in 1968. The Byrds's lineup changed many times, and after the last new lineup disbanded in 1972, the original members reunited to record an album, titled Byrds. ↑ 1.0 1.1 1.2 Hoard, Joel (2001). "The Byrds". Rolling Stone. Retrieved 19 February 2016. ↑ Hjort, Christopher. (2008). So You Want To Be A Rock 'n' Roll Star: The Byrds Day-By-Day (1965-1973). Jawbone Press. p. 113. ISBN 1-906002-15-0. ↑ Fricke, David (1996). "Fame and Misfortune: The End of the First Golden Era". Younger Than Yesterday (CD booklet). The Byrds. Columbia/Legacy. ↑ "The Byrds and The Monkees?". Planting Seeds Records. 1998. Retrieved 19 February 2016. 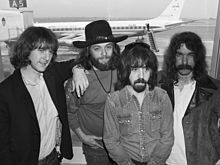 Hear the Byrds on the Pop Chronicles, 1969. This page was last changed on 2 June 2018, at 04:37.